Lets pause for a moment. Just a moment. If nothing more than to reflect on the journey ahead and behind me, while I sit somewhere here, in between. I began 2013 by heading out to Pai, a remote northern mountain town just three hours by car outside of Chiang Mai, Thailand’s second largest city. The idea was to work remotely, tapping away at assignments here and there while allowing myself some time to recharge a bit from the last six months I had spent living out of suitcase, burning up jet fuel and streaking tire marks between North and South America, the Middle East and finally back to Southeast Asia. So with a large bag and my projector split between two apartments in Bangkok, and another large box of books and a bag of assorted “stuff” collecting dust somewhere in Kuala Lumpur, I assembled only the “must-haves” of what life on the peripheries of society may require (tooth brush, socks, what-have-you) and set out to Pai, where I would find myself in a bamboo hut for the next two weeks among like-minded travelers equally fed up with the vagaries of the road. Pai seems to be a magnet for travel-worn souls, as well as those who are lost or wish they were. From its earlier years as an art colony for Thai artists, Pai soon became another loop on the northern Thailand tourist belt, a place for travelers to pause for a moment — or as long as they liked. 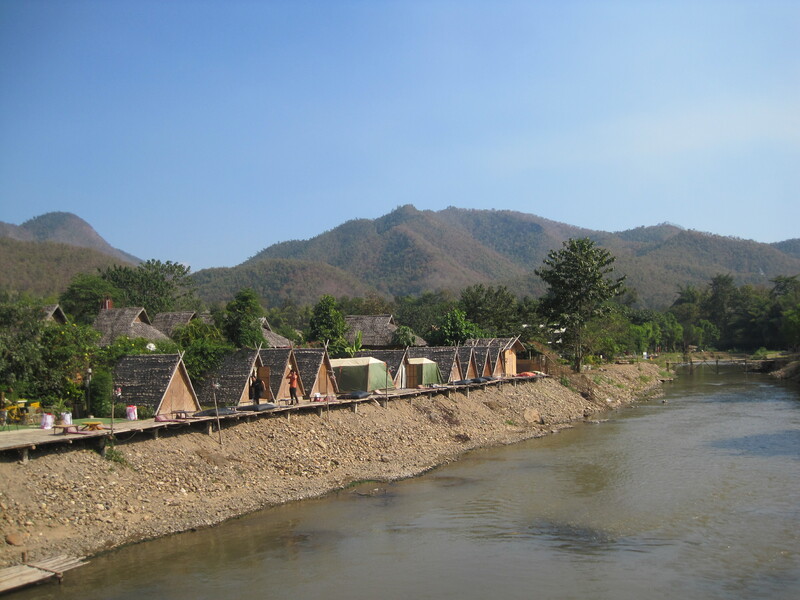 When a moment in time stops in Pai, there is not pre-defined length. Some expatriates, hailing from Japan, Italy and elsewhere, find such solace and comforting complacency in the agrarian mountain town that they set up camp for years or even decades, eventually adapting to the extreme temperatures that shift down to 7C at night and spike back up to 28C in the daytime. Annual seasonal flooding that wipe away the fragile bamboo bridges ever so delicately stringing the town together also must be weathered. To do this a trade must be mentioned. Some become farmers — others decide that running a guesthouse might be rewards. Still others get even more creative. One colourful character of Pai is an Italian baker, who plies the mid-day streets daily with fresh pastries, pizzas and bread fresh out of a wood-fire oven. This is the simple beauty of the simple place. Refreshed of my so-called “travel burnout,” my moment in Pai did not require me to obtain some impromptu trade. What it did force me to do, however, was analyse the concept of “home.” To me, it seems, without the burden of excess materials, your comfort level becomes much wider and much easier to incorporate those around you. Free from the anchors of material goods, “home” can become just about anywhere that allows you the moment, the time to stop and merely think about. 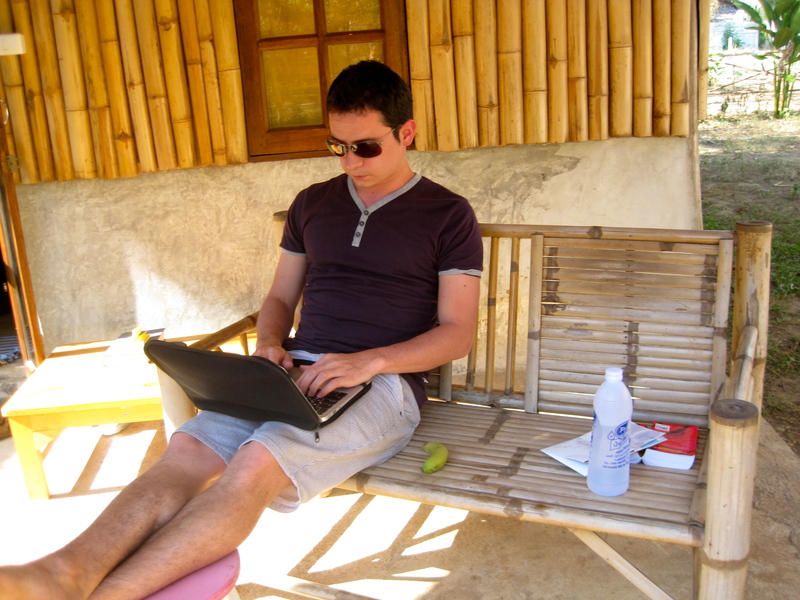 Here is a blog entry I wrote while I was in Pai about, yes, indeed, writing in Thailand. It covers the guesthouse woman I met during my stay, who is an ethnic Shan originally from a border town close to Myanmar.